Kiruna (Northern Sami: Giron, Finnish: Kiiruna) is the northernmost town in Sweden, situated in the province of Lapland. It had 18,148 inhabitants in 2010 and is the seat of Kiruna Municipality (population: 23,099 in 2008) in Norrbotten County. Esrange Space Center was established in Kiruna in the 1960s. Also in Kiruna are the Institute of Space Physics and the Department of Space Science belonging to Luleå University of Technology. Archeological findings have shown that the region around Kiruna has been inhabited for at least 6,000 years. Centuries before Kiruna was founded in 1900, the presence of iron ore at Kiirunavaara and Luossavaara had been known by the local Sami population. In 1696, Samuel Mört, a bookkeeper of the Kengis works, wrote on the presence of iron in the two hills. The Swedish senior enforcement officer and cartographer and mapper Anders Hackzell mapped the Kiruna area in 1736 and gave the mountains of the area their Swedish language names Fredriks berg (original Finnish name still in use as well: Kiirunavaara) and Berget Ulrika Eleonora (original Finnish name still in use as well: Luossavaara), after the King of Sweden Fredrik I and his wife Ulrika Eleonora. Despite the findings of large amounts of ore, no mining was initiated because of the remote location and the harsh climate. Some ore was extracted in the 19th century. It was extracted in summer and transported in winter, using sleds drawn by reindeer and horses. However, the costs were high and the quality of the phosphorus ore poor, until, in 1878, the Gilchrist-Thomas process, invented by Sidney Gilchrist Thomas and Percy Gilchrist, allowed for the separation of phosphorus from the ore. In 1884, a concession for a railway from Luleå to Narvik was granted to The Northern of Europe Railway Company. The provisional railway between Luleå and Malmberget was finished in 1888 and the first train left Malmberget in March. Around the same time, the English company went bankrupt and had to sell the line to the Swedish state for 8 million Swedish crowns, around half the amount initially invested. After a significant rebuild, the railway to Gällivare could be used again and iron ore was extracted at Malmberget by Aktiebolaget Gellivare Malmfält (AGM). At the initiative of Robert Schoug, the Luossavaara-Kiirunavaara Aktiebolag (LKAB) was founded in 1890. In 1893, Gustaf Broms became CEO of both LKAB and AGM. LKAB pressed for continuing Malmbanan via Luossavaara and Kiirunavaara to the ice-free coast of Norway. The continuation of the railway line to Narvik was controversial, because opponents feared the influence of Russia (then controlling Finland and already connected to Sweden at Haparanda–Tornio) on an international railway line. The decision to build was finally taken in 1898. The railway came to Kiruna 15 October 1899 and the Swedish and Norwegian sections were joined 15 November 1902. For LKAB, the great expense almost led to bankruptcy in 1901, just after the ore mining at Kiirunavaara had started. King Oscar II only opened the railway line 14 July 1903, preferring summer over winter to travel north. The architects Per Olof Hallman and Gustaf Wickman were appointed to design the city, to be built at Haukivaara, near both iron ore mines, with then revolutionary consideration of geographical and climatological circumstances; being built on a hill, winter temperatures are much milder than in other towns, and due to the street plan and the positioning, wind is limited. On 27 April 1900, Hallmans plan was officially accepted. Gustaf Broms proposed to name the settlements Kiruna, a short and practical name that could also be pronounced by Swedish speaking inhabitants. LKAB appointed Hjalmar Lundbohm, who had finished neither high school nor his geology studies, as local manager in Kiruna. Before the design for the settlement had been accepted, houses were built in a disorganized manner with illegal slums similar to those in the other mining town, Malmberget, 80 kilometres (50 mi) south of Kiruna. Also, provisional buildings served as a church, a school, a hospital, a hotel and a police station. However, official residences were built at a high pace, and when the king opened the railway in 1903, all illegal residences and most other provisional buildings had been demolished and replaced. The very first building, B:1, is preserved and can be seen at Hjalmar Lundbohmsgården. In 1899, 18 people were registered as living in soon-to-be Kiruna. This increased to 222 in 1900, 7,438 in 1910 and 12,884 in 1930. The residences did not fully keep up with this rapid growth; by 1910, there were 1,877 official rooms and some unrecognised residences, which meant that an average of three to four people lived in a single room; this density decreased steadily during the decades to follow. Kiruna became a municipalsamhälle (a community within a municipality) in 1908. This caused unhappiness in local organisations, such as Luossavaara-Kiirunavaara Arbetareförening, that had hoped for a status as köping, which would have kept more of the mining income inside the locality. In return, the mining company LKAB paid for a hospital, fire station, sewage, roads, a church (opened 1912) and the priest's home. In April 1907, a tram began operation in Kiruna, the northernmost in the world. This meant miners would no longer have to walk several kilometers through the sub-arctic cold, nor would they need to climb a hundred meters up the mining hill. The network consisted of three lines: bergbanan (funicular), stadsspårvägen (city tramway) and gruvspårvägen (mine tramway). The funicular closed in 1955 after a road up the mine was built 1949. The city line had a maximum length of 8 kilometres (5.0 mi) and was unique due to the 1-meter gauge, double windows and heated wagons. It closed in 1958 after gradually being replaced by buses. Between 1941 and 1964, a tram was used inside the mine, with wagons bought from closed tramlines throughout Sweden. The iron ore industry was good in the early 20th century. 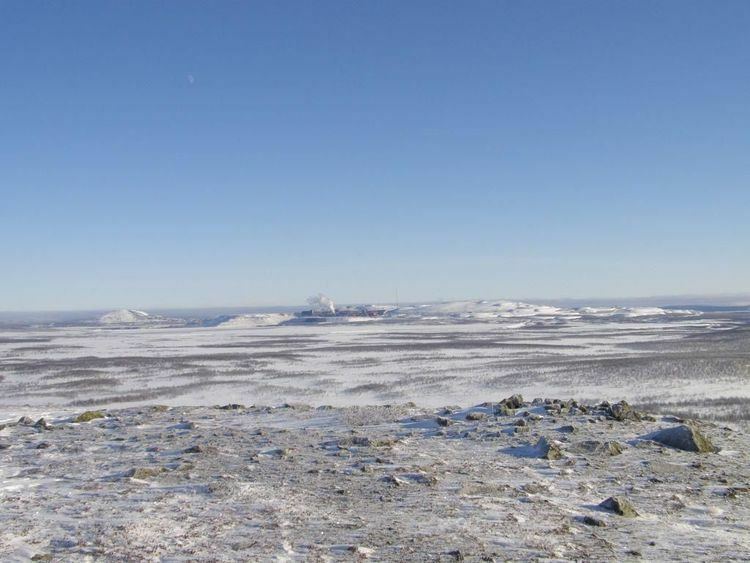 Before the start of the work, Hjalmar Lundbohm worried whether the Kiruna winter would allow for working outside at all, but despite early research into underground mining, mountaintop removal mining was the primary method in the early years. Mechanisation was attempted early using steam powered excavators, but the cold climate led to considerable difficulties and only when electrical machinery became available in the 1910s, significant mechanisation was achieved. The peak of Kiirunavaara, Statsrådet, was 247.7 metres (813 ft) above Luossajärvi until it was spectacularly blown off in 1910. A general strike hit Sweden in 1909 and Kiruna was no exception. Hoping for a better future, thousands of people left Kiruna, including a group of 500 inhabitants emigrating to Brazil. Most of them returned, disappointed that life in Latin America was not what they had hoped it to be, Hjalmar Lundbohm personally lent money for the trip home to some of the emigrants. During World War I, iron ore production dropped to the lowest level in LKAB's history, and when exports increased again, a successful three-month strike in 1920 led to a 20% increase in salaries for the miners. Production dropped to a minimum in 1922 and a three-day workweek was introduced, but during the fabulous twenties, it increased to a record nine million tonnes in 1927. In 1921, mining started at Kiruna's other hill, Luossavaara. However, the total amount of ore that could be mined in open pit mining here was small compared to Kiirunavaara, and LKAB preferred to concentrate resources in one place. Nevertheless, mining here continued until 1974 and later it became a research mine. During the first decades of Kiruna's existence, no road connected it to the outside world. The only connection was by railway or, as in the time before the railway, by boat (in summer) via the Torne and Kalix rivers to Jukkasjärvi and Håmojåkk and then proceed by foot. A road from Kiruna was built to Tuolluvaara in 1901, Poikkijärvi in 1909, Alttajärvi in 1913 and connected to Svappavaara in 1926, from where roads already connected via Vittangi to Pajala and via Lappesuando to Gällivare and further south. 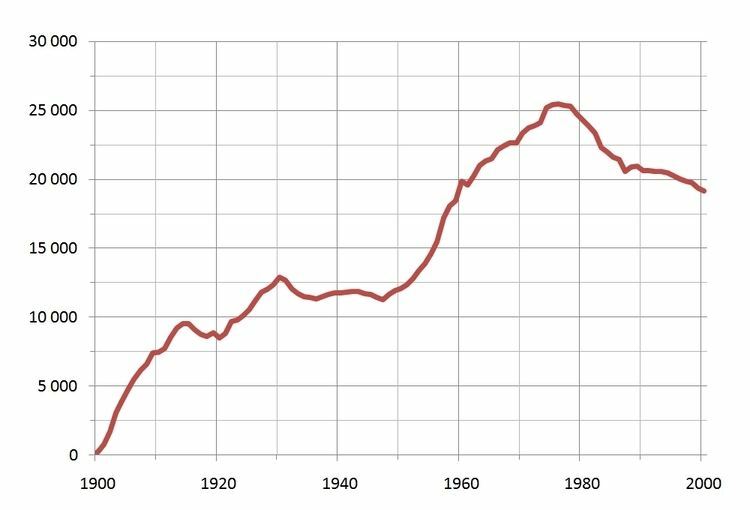 The Great Depression led to a 70% drop in ore production, a drop that would turn into a dramatic increase on the eve of World War II. Although some tourists had already started coming to the area in the 19th century, the completion of the railway line truly made tourism possible. Tourists came for the rivers and the mountains, but also geologists and entire classes of students came to see the mine. Additionally, a yearly winter sports festival was started, which attracted people from a wide area. The Sami population was already a tourist attraction in the early days of Kiruna's existence. The municipality of Kiruna shares borders with Norway and Finland, and Kiruna is located relatively close to both countries. This led to many soldiers being transported to the area whenever mobilisation was requested; first in September 1939 after the German invasion of Poland, then in November 1939 after the Russian invasion of Finland, but in both cases Swedish soldiers did not engage in any fighting. In March 1940, Churchill requested permission to transport soldiers from Narvik in Norway to Finland via Kiruna and Haparanda in Operation Catherine. Out of fear that the presence of British soldiers near the Kiruna ore mine would provoke a German attack on Sweden, the request was declined. After the German invasion of Norway, at least ten soldiers were stationed along every bridge along Malmbanan, to blow up the bridges should the German army invade Sweden. Additionally, foreigners were banned from visiting Kiruna or the iron ore line, and only the Sami, military personnel, locals and people working for the government were permitted to travel between Kiruna and Riksgränsen. After the battle at Bjørnfjell, 15 April 1940, wounded and fallen Norwegian soldiers were transported to Kiruna. Despite the conditions for Swedish neutrality, rail cars with food, skis and helmets were transported from Kiruna to the Norwegian soldiers in Bjørnfjell. Swedish iron ore from Kiruna was of major importance to the German war machine. A group of people working at LKAB organised in the Wollweberliga, planning to sabotage transports to Germany. In late November 1941, Edvard Nyberg, Ernst Wollweber and others produced a mine to be attached to the ore cars. Nyberg was caught, was fired from LKAB and spent 3½ years in prison. Upon his release, he founded Nybergs Mekaniska Verkstad which is still one of Kiruna's biggest companies. Germany requested that Sweden provide use of the railway network to transport military equipment, but the Swedish government agreed only to transitering av human karaktär, men ej underhåll till stridande trupp (transit of humanitarian character, but no supply of fighting soldiers). Germany argued that, now that Norway was occupied, the German soldiers there were no longer fighting, and thus transported a large amount of military equipment, ammunition and, secretly, troops from southern to northern Norway, via Malmbanan and Kiruna. Troops were often transported in transports declared as material transports. Despite being strictly against the rules, there was considerable interaction between the German soldiers and the Swedish locals, including trading and football matches. During the war, up to 2000 refugees from 20 countries were kept in Kiruna. German prisoners of war, for example, from crashed airplanes, were kept in Kiruna before being transported south. However, small-scale sabotage, such as sand in the engines, was common and loose weapons often ended up at the bottom of the Luossajärvi lake, next to the railway stop. North of Torneträsk, at Kaivare, a radio base Kari was built in secrecy and used by the Norwegian resistance. It was also used for the smuggling of arms to Norway and refugees from Norway. In 1948, Kiruna gained city rights and started to receive large amounts of money from the mine. The city centre was renovated starting it 1953; most buildings built before 1920 were demolished and replaced, and many of the current buildings were built in the following period. The town grew and new neighborhoods were built, as well as new apartment buildings and villas in existing neighborhoods. The area currently known as Lombolo was built in the 1960s. After World War II, the economy of Kiruna started to diversify. Initially, the mechanisation of the mining industry led to more mechanical workshops developing machinery for the mine, still dependent on the mining, but individual companies with spinoffs that could be sold to other areas than the Kiruna mine alone. In the 1950s, a fund, Norrlandsfonden was established, in which profits from LKAB would be invested in order to diversify the local economy. The municipality started to lend money to starting companies against very beneficial rates, a scheme that lasted until 1959 because the banks, that insisted this was false competition, had established more relaxed rules for lending out money. The industrial area east of the city was built in the 1950s to separate industry from neighborhoods. On 10 November 1960, Kiruna Airport opened to separate civilian air traffic from the military airplanes that had landed at Kalixfors airport and at Luossajärvi since World War I. A road to Nikkaluokta was opened in 1971 and to Riksgränsen and Narvik in 1984. The latter had been debated heavily, for alternative plans existed to build the road to Norway on the northern side of Torneträsk, via Laimo, Kattuvuoma, Salmi to Innset and Bardu in Norway. This road was never built, but a 25 km long track between Laimo and Salmi was built at the initiatives of the locals and finished in 1962; however, this track, called Talmavägen, is not connected to any other road. Increased communications were also beneficial for tourism. Swedish Railways had already run special trains before World War II, but started a special Dollar train in the summer months between Gothenborg and Kiruna, connecting to cruise ships from the United States. The canoe club Kiruna Långfärdspaddlare was founded in 1972 and rafting for tourists restarted after it had been discontinued for 20 years due to the drowning of Valfrid Johansson. Until the 1980s, tourism had been mainly a summer business, but touristic exploitation of dog sledging was started in 1983 in Jukkasjärvi. In 1990, the first Icehotel was built in Jukkasjärvi and advertised as the world's largest igloo. It had been built using techniques from the building of Malmbanan 90 years before, and was also inspired by the Snow Festival, that had started in 1986 to celebrate the Swedish Viking satellite. Since 1998, a special tourist area exists in the mine and since 1999, tourists can visit the various areas of research going on in Kiruna. In 1957, the Kiruna Geophysical Observatory (KGO) (now the Swedish Institute of Space Physics) was founded and established by the Royal Swedish Academy of Sciences. Esrange Space Centre is established in 1966. Here, rocket operations and ground-based observations are carried out since 1966, balloon operations since 1974, satellite operations since 1978 and testing operations since 2000 (with the Swedish Defence Material Administration). ESA has operated a satellite station near at Salmajärvi, near Esrange, since 1989. In 1987, Umeå University started a space engineering program in Kiruna, and GIS education was started by Luleå University of Technology in 1991. In 1993, The Umeå space engineers moved to the same building housing IRF and a year later another Luleå University programme, civil engineering with specialisation in space technology, started at the same location. Since 2006, the Erasmus Mundus Master Course in Space Science and Technology has started with at least one semester spent at LTU. In 2007, education along IRV was split and only the Department of Space Science, belonging to Luleå University of Technology, remained, while the Umeå University programme in Space Engineering quit. The Kiruna Icehotel has been built in Jukkasjärvi each winter since 1990 and is a major tourist attraction. Until the 1970s, Kiruna's population steadily increased as the iron ore economy was thriving. 1973 Was a record year for the iron ore company LKAB, mining 24 million ton ore from Kiruna and nearby Svappavaara. However, a steel crisis led to a dramatic decrease in the iron ore industry, and LKAB had losses in 1977 for the first time in decades. Additionally, increasing transport capacity led to increased competition from Africa, South America and Australia, where mining is mostly done in the open and is thus cheaper. In ten years, the number of employees decreased from 8,000 to 4,000 and the population of Kiruna began to drop. The mines at Svappavaara, Tuolluvaara and Luossavaara closed and only Kirunavaara remained. The local job office was jocularly called Resebyrån (the travel agency) because the only message to unemployed youths was: move. Since then, the population steadily decreased, but has stabilised in recent years due to the diversification of the economy. After year 2000 the rise in commodities prices has again increased mining activities in Kiruna, and created new job opportunities. Since 1985, the snow festival has been organised each winter, including various activities such as an ice sculpture contest. In 2000, on the hundredth anniversary of the city's foundation, the Kiruna festival was first organised and has since been organised every year in summer. The re-development of Kiruna is a reconstruction project, as the Kirunavaara mine, run by LKAB, undermines the current town center. Several buildings are to be moved or demolished. The town center is to be moved 3 kilometers to the east. The ground deformations became apparent in 2003, and the redevelopment started in 2007. In the same week, first sketches for the layout of the new part of the town became available. The sketches include a travel centre, the new locations for the city hall and the church, an artificial lake and an extension of the Luossavaara hill into the city. The location of the new section of the E10 is still uncertain, as is the location of the railway and the railway station. A more official sketch was published early in spring 2008, which was then discussed with various interest groups before a further version is to be produced. In June 2010 the municipal council decided that the town would be moved eastwards (to 67°51′1″N 20°18′2″E), in the direction of Tuolluvaara, instead of the proposed northwestern location. The moving of the town was started in 2014 and the plan describes a process that continues to 2100. White Arkitekter AB based in Stockholm and Ghilardi + Hellsten Arkitekter based in Oslo won the contract to design the new city together with researchers from Luleå and Delft Universities, which envisages a denser city centre with a greater focus on sustainability, green and blue infrastructure, pedestrians and public transport rather than automobiles. Kiruna is located in the north of Sweden, 145 kilometres (90 mi) north of the Arctic circle. The city centre is built on the Haukavaara hill at an altitude of 530 m, high above the Torne river to the north and the Kalix river to the south. Other parts of the town are Lombolo and Tuolluvaara. Near Kiruna are the mountains Kiirunavaara and Luossavaara. Kiirunavaara is an iron ore mine that is the town's primary economic resource. Luossavaara is a former mine and now used as a skiing slope. The city is built near the lake Luossajärvi with outflow to the Luossajoki that flows in the Torne river at Laxforsen. The area around Kiruna is very sparsely populated. The northwest, west and southwest of Kiruna are dominated by the Scandinavian mountains, visible from the city centre. Sweden's highest mountain, Kebnekaise, is 75 kilometres (47 mi) from the city centre and can be seen from it as well. To the west is Nikkaluokta and to the northwest are Abisko, Björkliden, Riksgränsen and the Norwegian town of Narvik, 180 kilometres (110 mi) via the road. 12 kilometres (7 mi) north of Kiruna is Kurravaara, on the edge of the Torne River. The land north of Kurravaara is roadless, uninhabited, partly barren and partly birch forest, up to the Norwegian and Finnish borders at Treriksröset. The lower-lying east is dominated by boreal forest, stretching hundreds (if not thousands) of kilometers into Finland and Russia. Around 15 km east of Kiruna is a group of villages at the Torne River, most notably Jukkasjärvi, where an ice hotel is built in winter, attracting tourists from all over the world. The twin cities Gällivare and Malmberget are some 120 km south of Kiruna. Kiruna became a Swedish city on January 1, 1948, and was at one time listed as the largest city in the world by area, even if most of its territory was non-urban. After the Swedish municipality reform in the 1970s, the term "city" has been legally discontinued. Today only the built-up area is considered a de facto city. Being located 145 km north of the Arctic Circle, Kiruna has a subarctic (Dfc) climate with short, cool summers and long, cold winters, although the city itself can be considerably milder than the surrounding forest. Snow cover generally lasts from late September to mid-May, but snowfall can occur year-round. The sun does not set between May 28 and July 16, and white nights lasts from early May to early August. The period that the sun does not rise lasts from 11 December to 31 December, the exact boundaries depending on local topography. Even though Kiruna's winters are very cold by Swedish standards, they are still much less severe than winters on similar latitudes in North America and Siberia, and even more southerly areas in other parts of the world due to some maritime influence. Similar winter temperatures go as far south as below the 45th parallel in the Russian Far East. Kiruna however, has cooler summers than such areas, but still warm enough to stay above polar climate and below the northern tree line. Winter temperatures however are significantly colder than areas immediately affected by the Gulf Stream such, where in fact the regular lows of Kiruna during January and February are colder than or similar to Tromsø's all-time record low. The coldest confirmed temperature ever in Kiruna was recorded at the nearby weather station with −43.3 °C (−45.9 °F) recorded in January 1999. The weather station recorded 31.6 °C (88.9 °F) in July 1945, which is the all-time record. The warmest month on record at the weather station was July 2014, with average high temperatures of 23.8 °C (74.8 °F). This was during a significant heat wave affecting most of Scandinavia with several northern stations recording exceptional heat considering their normal values. Kiruna has a gloomy climate, affected by Atlantic low-pressure systems. Due to its extreme daylight cycle, the period between April to August account for 73% of Kiruna's annual sunshine according to the 1961-1990 normals, whereas the five darkest months between October and February contain only around 10% of the annual sunshine. Kiruna is on the E10 road, connecting Luleå with Norway and passing near Gällivare (south of Kiruna) and Narvik (on the Norwegian coast). A short road connects to Kurravaara at the Torne river and ends there. Another road connects Kiruna with Nikkaluokta close to Kebnekaise and is used by tourists to get to the mountains. It passes by or nearby several villages in the Kalix river valley. Buses connect Kiruna with major towns in Norrbotten province and villages nearby and in the wider region. The railway connects Luleå with Gällivare, Kiruna and Narvik. Although built to serve the mine, Swedish Rail runs daily passenger traffic on the line: a night train from Narvik to Stockholm, a day train from Narvik to Luleå (connecting with a second night train to Stockholm and Gothenburg), and trains to Luleå and Narvik that start and finish in Kiruna. The latter is known as Karven and popular for day trips to the mountains near Abisko, Björkliden and Riksgränsen, particularly in winter. Additional long-distance trains are run by Transdev in summer. The railway station has since 2013 moved location 2 km away from the city centre so walking is possible but not recommended. There is a free shuttlebus for every departure and arrival which starts from Kiruna bustation in the city centre. Space research started in the late 1940s. The ESTRACK Kiruna Station of ESA, the European Space Agency, is located in the municipality. So is Esrange, the European Space and Sounding Rocket Range, as well as an EISCAT station and EISCAT scientific headquarters. Also in Kiruna are the Institute of Space Physics and the Department of Space Science belonging to Luleå University of Technology. In 2007, the Swedish government announced that Kiruna would be the host of Spaceport Sweden, signing an agreement with Virgin Galactic. Kiruna is the gate to Europe's biggest non populated areas and untouched wilderness. Tourism is an important source of income for Kiruna and the surrounding region, with around 300,000 tourist-nights per year (1998). Visits to the mine, the church, Abisko Scientific Research Station and the Institute of Space Physics or Esrange and hunting and fishing are all possible. Tourists explore sami culture, particularly in combination with winter activities such as dog sledding. In summer, there is hiking in national parks such as Abisko National Park and in the mountains up to Kebnekaise, walking on trails such as Kungsleden and Nordkalottruta, caving, rafting, canoeing and boat trips on lakes. The location north of the arctic circle draws tourists for the midnight sun. The annual Kiruna festival is a music festival in the midnight sun. In winter, the Icehotel and northern lights attract tourists. The long and certain snow cover, which generally lasts from October to May, and frozen lakes and rivers facilitate cross-country and alpine skiing, dog sledding and snowmobiling. There are ice climbing in the mountains and ice skating on lakes or rivers. The annual Snow festival is held over the last weekend of January and includes scooter jumping, reindeer racing and an ice sculpture contest. Kiruna FF is a Swedish football club located in Kiruna. The club currently competes in Division 3 Norra Norrland, the fifth tier of the Swedish football league system. Kebnekaise BTK is a table-tennis club located in Kiruna. The club competes in Div 1 Norra, the third tier of the Swedish table-tennis league system. Kebnekaise BTK has consistently been one of Northern Sweden's most successful table-tennis clubs. Practice takes place in Sporthallen, the sports center located in central Kiruna. In the village of Jukkasjärvi, there is an Icehotel which is reconstructed annually for the winter. Kiruna Church, built in 1912, is one of Sweden's largest wooden buildings. The church exterior is built in a Gothic Revival style, while the altar is in Art Nouveau. In 2001, Kiruna Church was voted the most popular pre-1950 building in Sweden, in a country-wide poll conducted by the Swedish Travelling Exhibitions, a government agency connected to the Ministry of Culture. The first indoor ice hockey arena in Sweden, Matojärvi. The arena has been visited and played by many of the most famous ice-hockey players in Sweden. Legends as Börje Salming, Mats Sundin and Peter Forsberg.